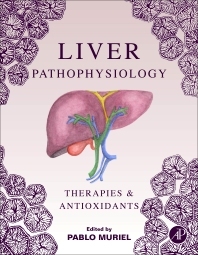 Liver Pathophysiology: Therapies and Antioxidants is a complete volume on morphology, physiology, biochemistry, molecular biology and treatment of liver diseases. It uses an integral approach towards the role of free radicals in the pathogenesis of hepatic injury, and how their deleterious effects may be abrogated by the use of antioxidants. Written by the most prominent authors in the field, this book will be of use to basic and clinical scientists and clinicians working in the biological sciences, especially those dedicated to the study and treatment of liver pathologies. Presents the most recent advances in hepatology, with a special focus on the role of oxidative stress in liver injury. Provides in vivo and in vitro models to study human liver pathology. Explains the beneficial effects of antioxidants on liver diseases. Contains the most recent and modern treatments of hepatic pathologies, including, but not limited to, stem cells repopulation, gene therapy and liver transplantation. Oxidative and Nitrosative Stress: An Interplay? Chapter 19. Is Human Cirrhosis a Reversible Disease? Chapter 52. Are N-Acetylcysteine and Resveratrol Effective Treatments for Liver Disease? Chapter 53. Does Nutrition Matter in Liver Disease? Dr. Muriel has research experience in the pathophysiology and pharmacology of liver diseases including necrosis, fibrosis and cholestasis; the role of cytokines in liver diseases; and oxidative stress and its relation to liver disease. He has published over 100 articles (original and reviews) in addition to 7 book chapters in the area of the liver and has also directed the thesis on dozens of postgraduate students in the same area over the last 30 years. The majority of his work has been in the Medicine and Pharmacology areas. He shows strong and growing citation counts from 2010-2017. An interesting book consisting of excellent reviews on various topics on liver pathophysiology. Every authors have worked very hard to make their chapters comprehensive and fine. The book surely introduces the readers the evolving science in from basic and clinical standpoint.